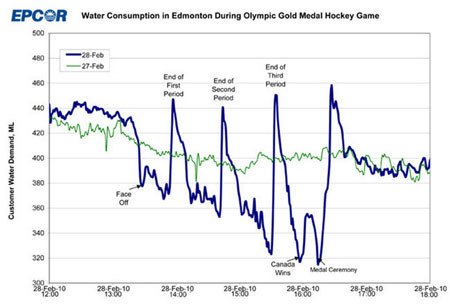 A few days after the Canadian men’s hockey team won the gold medal at the Vancouver Olympic games, the city of Edmonton’s water utility published an incredible graph of water consumption. Since up to 80% of Canadians were watching the game, it stands to reason they would wait for a break in the action to use the bathroom. They look about the same, don’t they? Seems like Canada is full of people with patriotic bladders. Which goes to show what a relief Sidney Crosby’s goal was, in more ways than one.